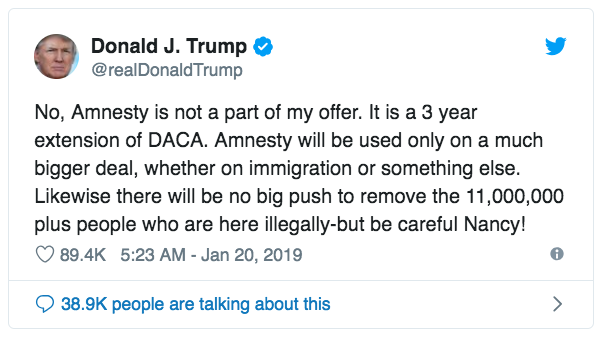 President Trump on Sunday said that while amnesty is not part of the offer he made on Saturday to end the government shutdown, it could be a part of a “much bigger deal.” He warned Democratic leader Nancy Pelosi, however, to tread carefully. He added, "Likewise there will be no big push to remove the 11,000,000 plus people who are here illegally-but be careful Nancy!" His remarks come after a Saturday address in which President Trump proposed a deal to end the government shutdown that would include his funding for the wall and other border security measures but also a three-year extension for the Deferred Action for Childhood Arrivals (DACA) program and immigrants with Temporary Protected Status (TPS). “This is not a 2000-mile concrete structure from sea to shining sea,” he said during his speech on Saturday. “These are steel barriers in high priority locations." Regardless, Democrats quickly rejected the proposal, calling it a “non-starter,” and demanded that the government be reopened before further negotiations on immigration commenced. Senate Majority Leader Mitch McConnell said that he will be presenting the proposal to Congress this week.